I am always thinking of black people. 90% of the time i’m also thinking about a story or playing a scene in my head. These past few weeks, my head-movies have been filled with black sorceresses and warlocks, wizards and shamans and illusionists and mages. I think it’s all Quick Ben‘s fault. I just finished the first book in Steven Erickson’s Malazan: Book of the Fallen series. Malazan is one of those bighuge seven plus books series, so I’m not sure what happens in the future…but in the first book, Quick Ben is badass. The appearance of wizards in fantasy art, and description in literature, is uniform to a great extent, from the appearance of Merlin in Arthurian-related texts to those of Gandalf in The Lord of the Rings. The association with age means that wizards, both men and women, are often depicted as old, white-haired, and (for men) with long white beards so majestic as to occasionally become host to lurking woodland creatures. It predates the modern fantasy genre, being derived from the traditional image of wizards such as Merlin. Some theorize the look of the wizard is modeled after the Germanic god Wōden or Odin as he was described in his wanderer guise as being an old man with a long gray beard, baggy robes, a wide-brimmed hat and walking with a staff; he has been postulated as the main influence for Tolkien’s Gandalf. Wizards and Magicians are godly beings, and their looks are based on what people who write this stuff thought gods looked like: guys resembling themselves wrapped in swaddling cloaks and sporting dope facial hair. That’s not to say that black wizards (or wizards whose physical appearances are based on other groups of PoC) are nonexistent. Ged, the wizard in Ursula LeGuin’s Earthsea cycle, is quite deliberately “red-brown” of skin. Wild Seed is full of sorceresses and wizards–Anyanwu is a direct spiritual ancestor of a minor sorceress in one of my works. Yulwei and One-Eye are masters of their respective crafts, and loom large in their own universes. But the wizards and witches and sorceresses and shamans in my head exist in all magical traditions. 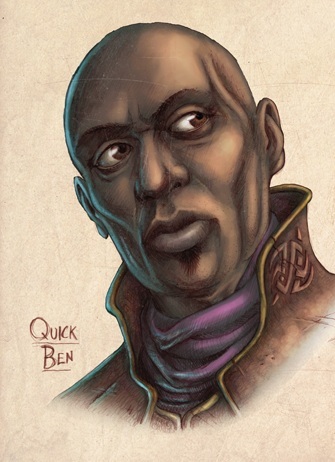 Even Quick Ben, for all his awesomeness, is mired in the same magical system as his counterparts. Warrens, while a dope concept, lack the specific kind of…blackness that I think would really be awesome in a fantasy magic system. Most of my stories these past few months have been writing exercises featuring a woman named Carmen Vega. Vega is a dreadlocked Alchemist who is one part Onyesonwu, one part Geralt of Rivia and one part the woman-assassin with dreadlocks that used to live in my head-movies back in my high school days. Vega’s an updated (then scaled back) root woman who talks to her ancestors when the moon is full. Because why not? I’m sick of wizard’s fire and thundering declarations crashing from the mouths of old white men that topple beasts of shadow. I’ve drawn from a lot of traditions when thinking about the kinds of magic that i’d like to use in my work. One of my sorceresses looks a lot like Badu circa early 2000’s: top hat, afro, head wraps, nice kicks, cool glasses. Hip Hop and Soul Music are both traditions of black (people) magic, and they have their roots in the bubbling spirit and soul of the black folks who mixed up Africa and America and made something totally new. Another one of my sorcerers is a trickster, working for a god: he has Brer Rabbit‘s ears and Stagger Lee‘s wicked demeanor. Black folks are possessed of a unique kind of prestidigitation: the kind of survivalist trickery that tells you that you gotta be the baddest mofo around–but you have to remember not to flaunt it. Even still, that badness you’re keeping under lock and key seeps out into you, shows itself in your steps and slang. Our traditions and history skirt several belief systems and we’ve picked up a great deal of mythological and psychological coping mechanisms through our time in these various places. These things belong in magic, and we should put them there, put our histories in our fantasies and make them something to be reckoned with. Everybody else gets their own kind of magic–and if you’re thoughtful about creating a system of magic, magic is for everyone. I think it’s time for a black child (or black adult) to realize that they too can be a magical king or a queen, dark and beautiful and terrible as the morn, and stronger than the foundations of the Earth. Thanks for this . You reminded me that the whole wizard thing is ripe for revision and subversion. And that it is also an ongoing practice. Octavia, Ursula, and Cook giving us some ideas to play with. Nice job. I must respectfully disagree hurling fire and calling lightning are ” black” magic; along with flight,shape shifting, inviability and the ubiquitous weather working. One of the only instance of a magician throwing and lightning that I have come across from real world mythology are from the life of Shango, prior to his post mortem ascension to divinity. Personally I’d rather figure out how to mainline the fires of creation( Ashe) then get magic by cutting a deal with some spirits, even when they are not malicious the terms that they impose always come back to bite you. In my stories I established three distinct schools of magic: a spiritualist school (religious, spirits, divinations, etc), Non-Elemental or Pure Magic (the Harry Potter, Merlin, Gandalf type), and Elemental (more akin to Fullmetal Alchemist, who call themselves alchemist). Each school requires it’s own rules and its own limitations, and that is hard to keep straight. My characters are mostly of the spiritualist and elemental schools with non-elemental being considered “the enemy”, real and imagined. That sounds like an awesome system of magic! I can’t wait to read whatever you’re working on that contains it. All this is great. It’s funny, recently I was imagining how cool it would be to have a story with characters who use hoodoo magic. I love the idea of people needing to perform rituals and connect with spirits to use their powers, as a way of keeping in tune with their heritage. To me, it’s a lot more fascinating than the depiction of magic as a free-floating element, requiring minimal effort or consciousness to apply, that I’m used to seeing. Developing a unique and believable system of magic is one of my deepest desires as a fantasy writer. We are long overdue for nuanced depictions of magic and sorcery in fantasy fiction, rather than the “hitting the lotto” or “everyone’s a godlike being” systems of magic we have in place now. I take my inspiration from Ursula LeGuin, Garth Nix, Steven Erikson, Octavia Butler, and Ben Okri, to name a few. Masters of this sort of thing.